As a regular contributor to the London-based jewellery, fashion and watches magazine, Anabel has created edits and written text for their 8 Things We Love feature. As a Freelance Digital Content Editor, created content for the blog of the luxury RTW knitwear label. As Executive Editor, composed content themes, selected product and wrote copy for a luxury-interest readership. As Freelance Digital Content Editor across Womenswear for Debenhams.com, created engaging fashion, lifestyle and news articles for their blog TheDailyDebrief.com. Created beauty content for the blog of the British luxury skincare brand. Developed imagery and wrote content around luxury interest, spanning fashion, travel and art as Editor for Couturelab and sister site GiftLab.com. A travel guide for Hong Kong for GiftLab's blog. Click to read. Conducted interview with Nina Garcia, Fashion Director of American Marie Claire and judge of Project Runway. 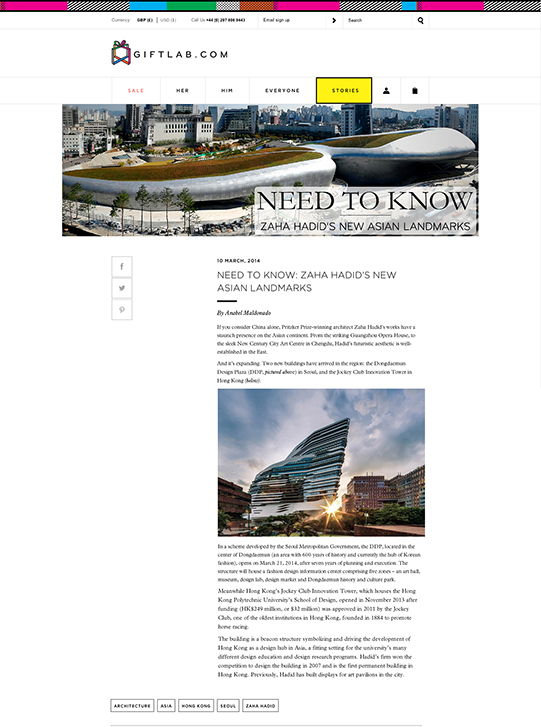 A post profiling architect Zaha Hadid's works in Seoul and Hong Kong.